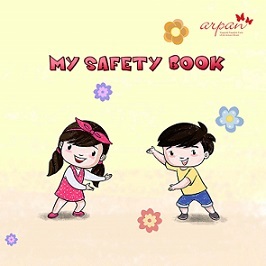 This colourful picture book initiates conversation on personal safety between children and their caregivers. It teaches children that their body belongs to them and encourages them to take an active part in keeping themselves safe by refusing an unsafe touch and seeking help. Through an engaging narrative and lively illustrations, this book helps children become confident in being safe without being overly anxious or fearful. My Safety Book is an effective tool for caregivers to initiate a healthy conversation on a sensitive issue. 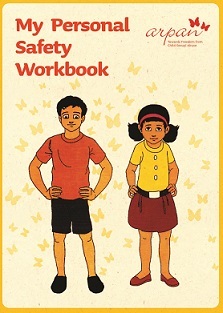 The Personal Safety workbook operates from the premise that all children are unique and special and they have a right to be safe and protected. In order to arrive at this, the workbook initiates in building the self-esteem and self-confidence in children. Having positive self-esteem is the bedrock on which other life skills, like assertiveness, decision making and critical thinking, can be built on. ‘Touching Rules to keep me safe’ and ‘Parenting Tips to keep Children Safe’ posters can be put up in schools, homes and institutions that work with children. This is an effective tool for the recall of Personal Safety messages.